Joscha Beninde Newly arrived from his PhD in Germany, Joscha is using landscape genetics to understand how species survive and thrive in urban environments. 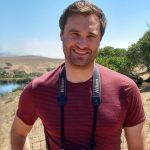 At UCLA, he will be working on a collaborative project with the La Kretz Center and the Sustainable LA Grand Challenge to map the genetic diversity of 15 species of plants, butterflies and vertebrates inhabiting the LA Basin. His goal is simple: to increase the biodiversity of native species across our city. Adam Clause recently completed his Ph.D. at the University of Georgia, and has returned to California to assist with an ambitious landscape genetics project across the LA Basin. In collaboration with partners including the Natural History Museum of LA County and the National Park Service, he is spearheading sample collection of a diverse suite of plant, invertebrate, and vertebrate species across the urban-wildland interface. 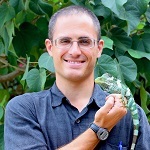 Adam’s prior expertise centers on the intersection of ecology and conservation policy for imperiled herpetofauna (particularly lizards) in California, Mexico, and Fiji. Evan McCartney-Melstad uses genomic datasets and tools to answer questions in ecology and conservation that are difficult to address by other means. He is particularly interested in investigating how landscapes and seascapes structure and influence animal populations and the resulting implications for conservation. 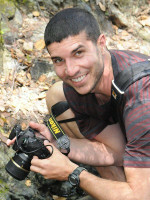 Evan’s research involves gathering and analyzing genomic datasets to answer: 1) How energy developments affect the federally protected Mojave desert tortoise and 2) What are the driving factors behind the hybridization of the invasive barred tiger salamander with the endangered California tiger salamander. In addition to these empirical systems, he is working to make genomic technologies and bioinformatics analyses more applicable to large genome amphibians. 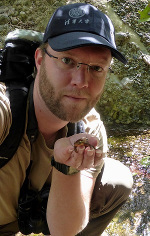 Peter Scott is an evolutionary biologist and herpetologist interested in explaining mechanisms responsible for lineage diversification and persistence. Always having a love for amphibians and reptiles, he finds it both rewarding and natural to find appropriate systems in herpetology in which to base my research. 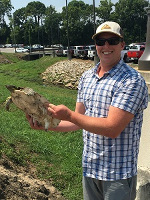 His work in the Shaffer lab investigates the utility of different genomic sequencing methods (RADseq, exon capture, whole genome) for resolving difficult nodes in the Tree of Life and will practically attempt to infer species limits and relationships with Pseudemys turtles. Previously he has worked on understanding systematics, species limits, hybrid zone dynamics, population and conservation genetics, and population ecology or North American turtles in the genus Sternotherus and phylogeography and systematics of whiptail lizards in Baja California, Mexico.